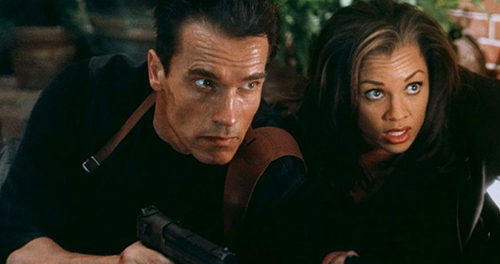 Arnold Schwarzenegger is a witness protection agent trying to keep Vanessa Williams alive long enough to testify against her former employer, a manufacturer of new, deadly high tech assault weapons. Matters are made worse when Arnold realizes members of his own team are working against him. Eraser is a summer-time explosion movie with non-stop action. It mostly satisfies as a popcorn flick, but could have been more memorable if it had more of a sense of humor and more compelling characters. It’s perhaps Arnold’s most one-dimensional character to date (and he’s played robots). Williams holds her own in both acting and action. James Caan leaves the biggest impression as a traitorous federal agent. James Coburn is present for a few quick scenes while Alan Silvestri phones in a score comprised of leftover recordings from his earlier works. The most indelible scene for me was an attack on Vanessa Williams’ home that offers the first demonstration of the mysterious weapons. When an attacker points the gun at the house, it quickly offers an x-ray view through the walls and furniture, eventually landing on a moving skeleton, and then zooming in to target the heart beating within its bones — a chilling concept I hope is never realized. Another memorable moment involves an alligator tank spilling out into a fight scene in-progress. With Robert Pastorelli, James Cromwell, and Danny Nucci.